Almonds / Badam Payasam | Simple and Delicious ! Since I was little busy, I had been looking for a simple recipe to publish this week. This was waiting for long in the line, now it is best time to show its face, specially in this hot weather..
Actually I had no idea what to call this, simply a payasam or a delicious chilled drink? A drink prepared with almonds would always be rich and delicious! I loved it when served chilled, especially its thickness with almond taste.. Do add more milk to change the thickness according to your taste. Peel badam. (see here how to peel badam). Grind it with little milk to a thick paste. This paste should be fine. Boil milk. Add this paste to the boiling milk. Add sugar and powdered cardomam. continue stirring. When this begins to thick, add few saffron strands and remove from fire. Put crushed pistachios or cashewnuts. I prefer drinking this chilled. 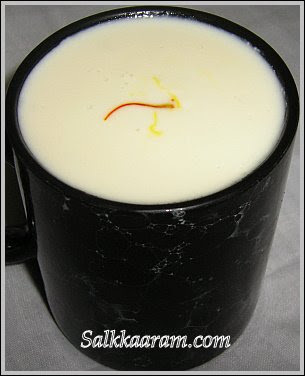 Badam drink is to any season, have it cold or hot it is delicious! Did you chande you deco of the blog. 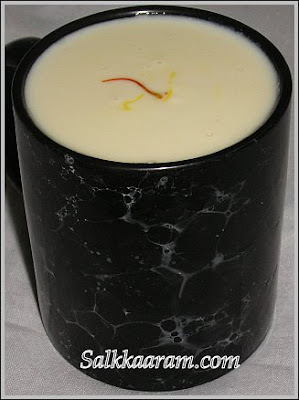 gorgeous payasam! almonds make anything yummy. Pic looks great. awesome..i can drink that full cup in a single sip!! i should say ur taste is almost similar to mine and it reminds me of my mom's cooking. not too spicy...and i too dont like adding cashew and raisins in biriyani. i'm not an expert in cooking and just started after coming to qatar last year. thanx for all the simple and delicious recipes. ur work is awesome and best wishes for making it even better.